Chabad provides business people, students and homemakers the opportunity to take some time out of their busy work week - whether at the office at home or even on the go - to study Torah, from the weekly Parsha to the technical intricacies of Jewish Law, the stimulating logical analysis of the Talmud to the spirituality and meaning of Chassidus and the Kabbalah. Whatever the topic, studying one on one with the Rabbi or Rebbetzin is bound to bring some Jewish spirit into your life. 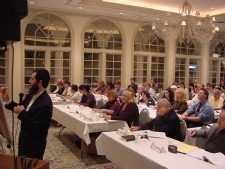 Call us today for your one-on-one Torah class or for our next upcoming Class you will be raving about.